We will begin with one of our all-time favourite Hosses. This player never backed down from any opponent, despite his 5'11", 200lbs stature. He played the game as hard and intense as anyone. Fighting much bigger players than himself, throwing big hits to fire up the team, and potting goals in the clutch; this player exemplified what it means to play with heart. He also had awesome handlebars. This player is Wendel Clark. Drafted first overall at the 1985 NHL Entry Draft, Wendel came to the struggling Maple Leafs and lit a fire. Clark would become the team captain in 1991, and would help lead the Leafs to that memorable (or forgettable) Conference Finals in '93 against the Kings. Clark's big hits earned him the nickname "Captain Crunch" and made him one of the most feared players on the ice - just ask Bruce Bell. Wendel always found his way home to the Toronto Maple Leafs, where he was loved by the home fans, and feared by opponents. Arguably the most popular Leaf in the modern era, Clark was honoured in 2008 by having his number raised to the rafters of the Air Canada Centre. Ask any Leafs fan about Clark and I’m sure you’ll hear a story of Hoss proportions. This video pretty much sums up what being a Hoss is all about, and Wendel was one of the best at it. Welcome to the Hall, Wendel. I was unable to see most the links and video because i'm at work but i will when i get home. there is one picture that i saw: two refs and and a Winnipeg Jet player all of their mouths are open and in shock. Whats going through their mind... Probably, Holy #u*k that WENDEL CLARK WHAT A HOSS!!!! David Johnston. The Gazette. Montreal, Que. : Mar 15, 1986. March 3: Clark scores two goals - including his 29th of the season, a team record for rookies - to lead Toronto to a 6-1 victory over the Winnipeg Jets. The next morning, the newspapers say, "WONDERFUL WENDEL! . . . the first real hero around Maple Leaf Gardens since Lanny McDonald and Darryl Sittler were a crowd-lifting tandem . . . the league's top rookie . . . now Toronto's most prominent athlete." The Gazette. Montreal, Que. : Sep 26, 1986. TORONTO (CP) - Craig MacTavish has been through a lot the last 2 1/2 years. Being mugged is no big deal. He's reconstructed his life since spending a year in prison for vehicular homicide and, today, is one of the top Edmonton Oilers. In an NHL preseason game Wednesday night, MacTavish scored two goals and assisted on another as his team humiliated the Toronto Maple Leafs 8-2. Edmonton's comeback silenced the capacity crowd of 16,182 and reduced the Leafs' collective fuse to the point of explosion. Ensuing brawls led to the ejection of 14 players. 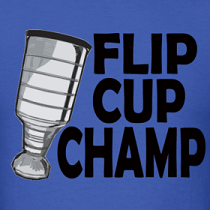 MacTavish, since he was the best player on the ice, was the obvious No. 1 target. He was set upon by Toronto forward Wendel Clark with five minutes remaining. Clark punched MacTavish in the face, opening a deep cut over the left eye, and continued flailing away at MacTavish after the dazed Oiler had fallen, his blood forming pools across the ice. "He skated over and dropped his gloves and grabbed me," MacTavish said, downplaying the assault after a shower and shave. "I should have known right there that it wasn't going to be a friendly conversation." "He (Clark) sucker-punched Craig," said Edmonton coach Glen Sather. "He hurt him. "Then he kept hitting him when he was down." Wendel is everything a hockey player should be. Hit hit, he fought and he could score. He was a leader and he was tough as nails. A true Hoss indeed. 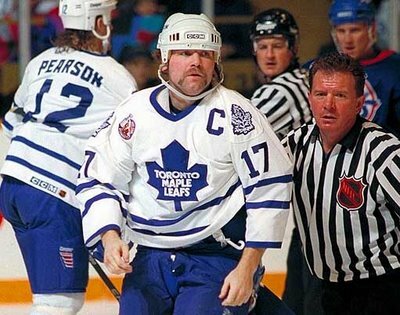 I remember watching Wendel playing in a exibition game hitting,fighting scoring. Thinking this is going to be great watching this guy over the years. He was the only reason to watch the leafs back then. Then Gilmour and Clarke got together and made things happen. I hope you plan on paying for the use of the Wendel Clark Image on your site. Preferably not, but we will credit the photo if there is a photographer's name? We don't want to just write "Anonymous"